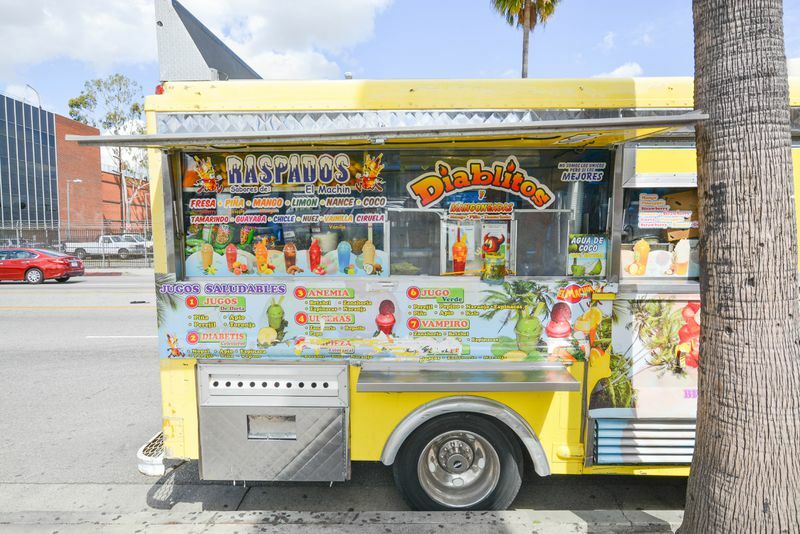 On any given sunny weekend day, numerous venues sell stellar Mexican street food in Los Angeles. The newest is the budding lineup along Whittier Boulevard in East LA in front of Target and McDonald’s. 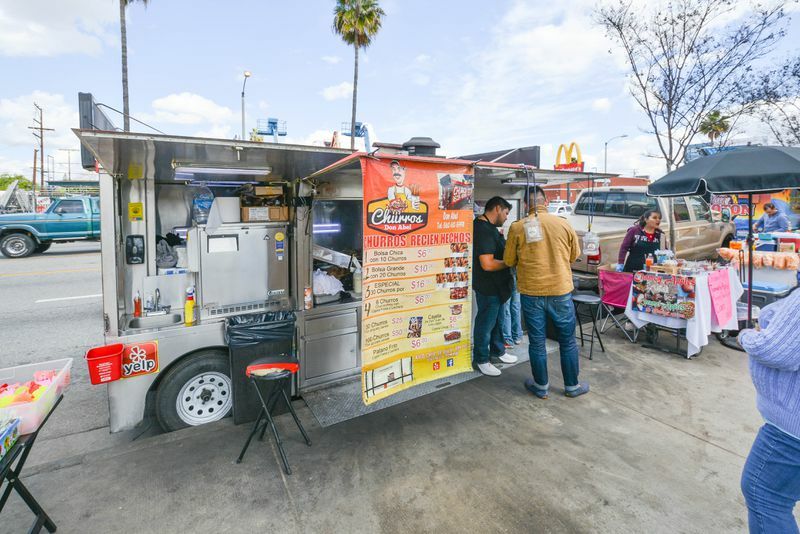 Vendors such as Birrieria Gonzalez, which already has a storefront practically adjacent to the Target, set up trucks and trailers along the boulevard hawking warm, juicy birria de res, Sonoran-style coyotas, and freshly fried churros laced with dulce de leche and strawberry sauce. 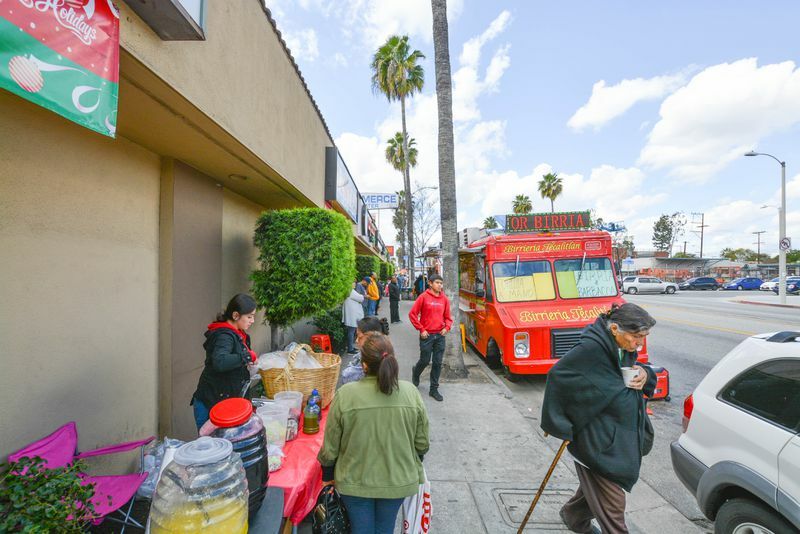 About eight miles west in Downtown LA’s warehouse district, a cluster of street food locally referred to as Mercado Olympic boasts a massive collection of vendors preparing a bounty of Mexican classics like quesadillas de moronga. 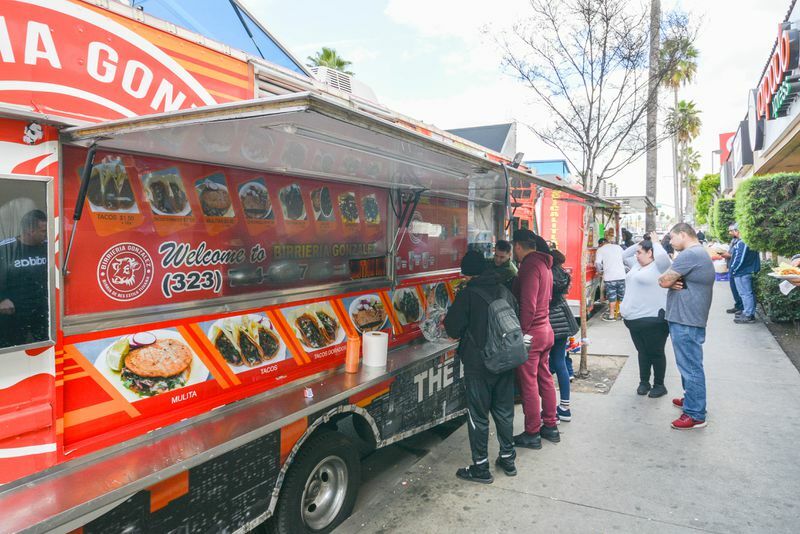 That market is well established at this point, gathering vendors for the past five or six years strong, but this newer set of vendors along Whittier Boulevard is East LA’s hot new street food scene. 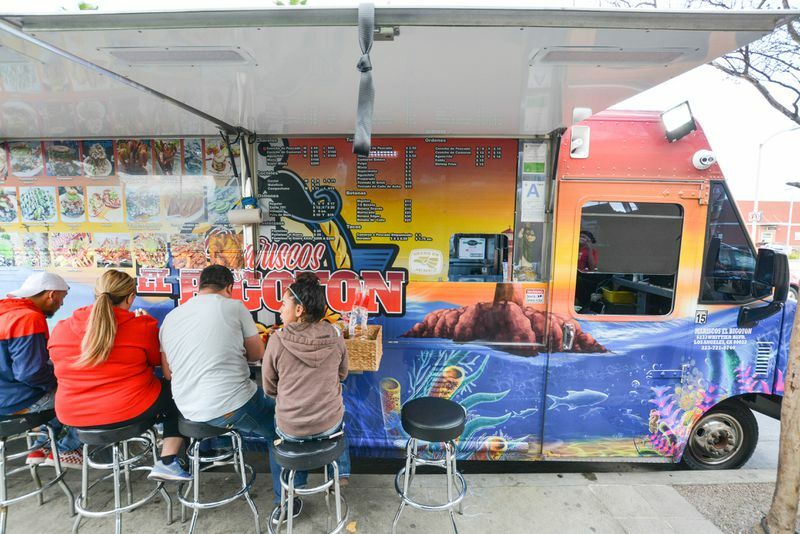 Stationed in a single-file line, these vendors represent a smorgasbord of daytime fare, like Sinaloan shellfish and seafood ceviche from Mariscos El Bigoton, and even chamoy- and tamarind-encrusted candy apples. 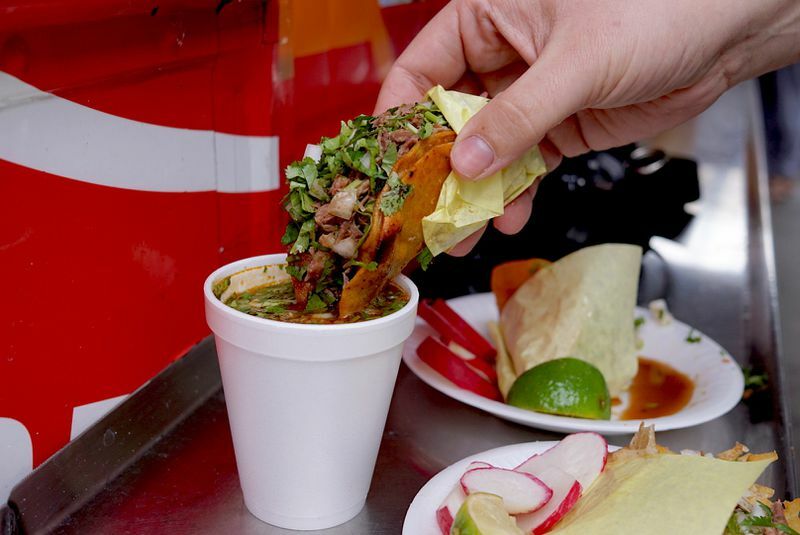 In the evenings, longtime truck Tacos Cuernavaca sets up on the opposite site of the street cooking some of LA’s finest tacos from the state of Morelos, but morning and afternoon hours beckon street gourmands looking for something lighter. 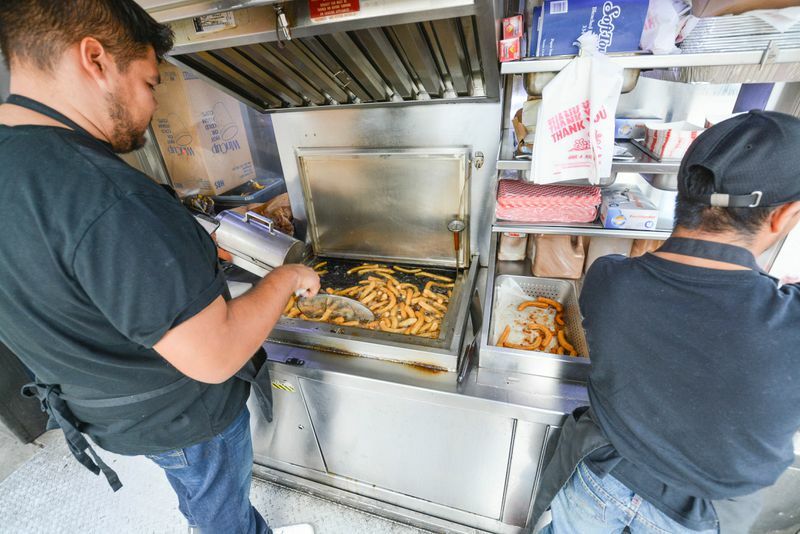 However, the choose-your-own adventure nature of this single-block food crawl could mean some more substantial courses, like cheesy, shrimp-covered fries or some freshly fried churros. 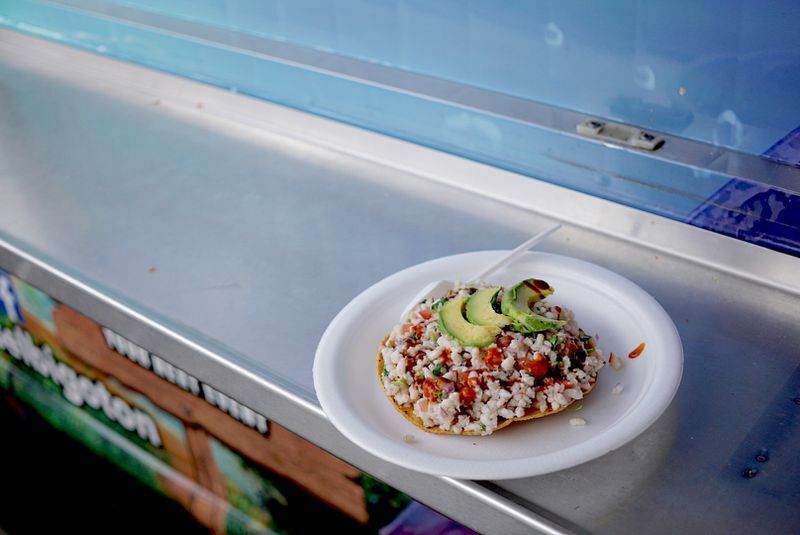 Here are some of the highlights from Whittier Boulevard’s upstart street food finds. 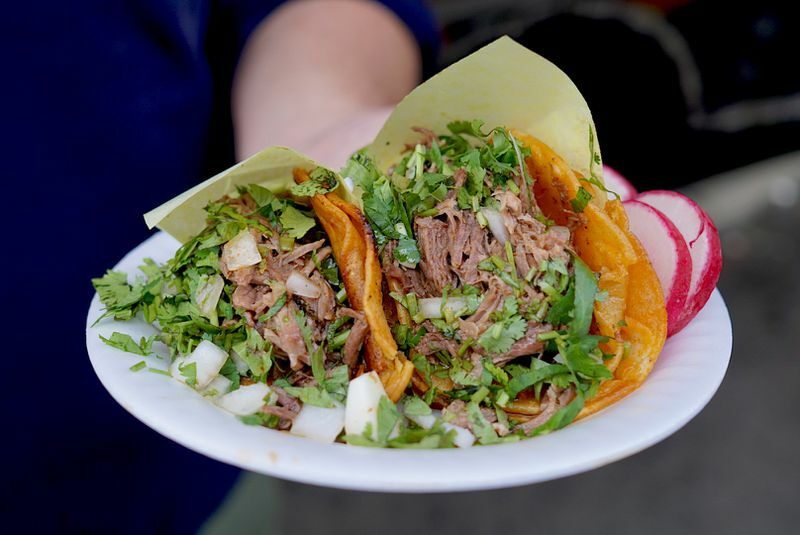 Birria de res, one of LA’s most popular new daytime taco formats, hails from Tijuana, and Birrieria Gonzalez is one of the city’s best examples. While the slowly braised and cooked beef at Gonzalez doesn’t feature that incredible red tint like the version from Teddy’s, the depth of flavor here is undeniable. Juicy, chopped beef comes on dense tortillas, with a covering of fresh cilantro, salsa, and chopped onions to balance out that intense meaty flavor. 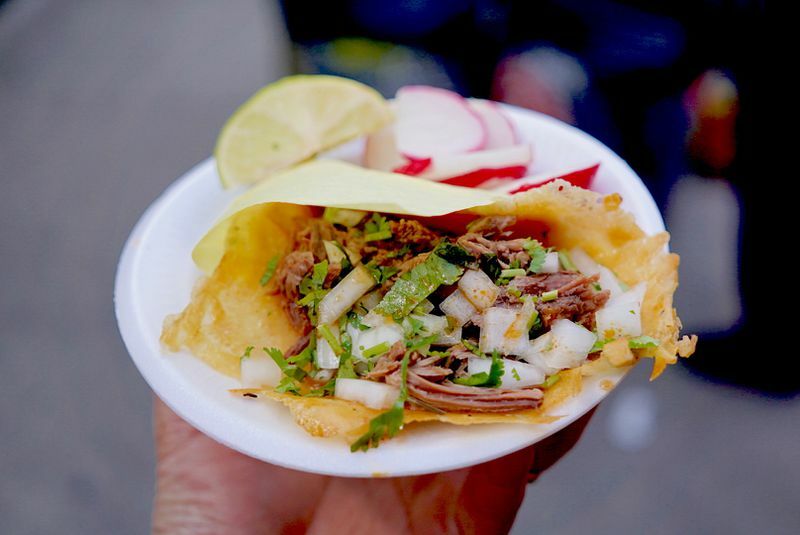 Though birria de chivo, or goat birria, has perhaps been around longer in East LA and Mexican-American communities, the rise of birria de res throughout the Southland proves that Angelenos just love beef. 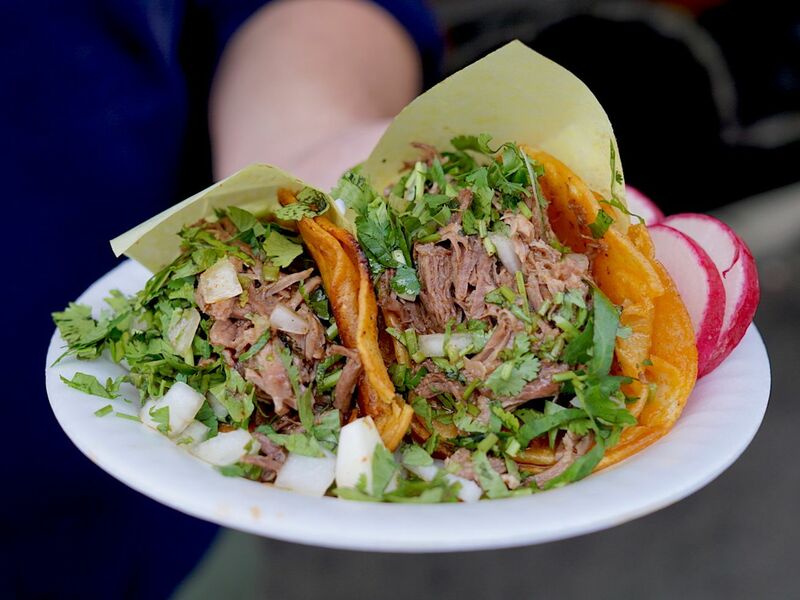 The notable difference between birria de res and birria de chivo is that stark bluntness of beef as a medium for juicy tacos instead of a more nuanced, slightly gamey finish of goat. A heady consomme with a palate-filling umami richness completes the picture. Anyone looking to amp up their Instagram game can opt for the quesotaco, a low-carb, high-fat creation with griddled cheese as a tortilla. Just remember to squeeze in some fresh lime to help cut through the incredible richness. Morning mariscos is the other side of the Mexican weekend-warrior menu, and with its Sinaloan background, Mariscos El Bigoton takes the format to the max. 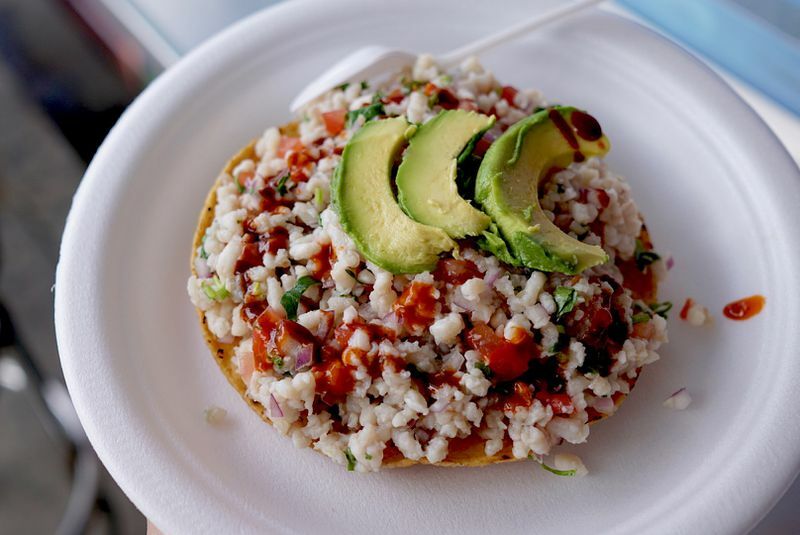 Though the seafood towers are the main Instagram draw, with expertly constructed cylinders of pristine shrimp, fish, avocado, and chopped octopus, there are some standard ceviche tostadas to enjoy as well. 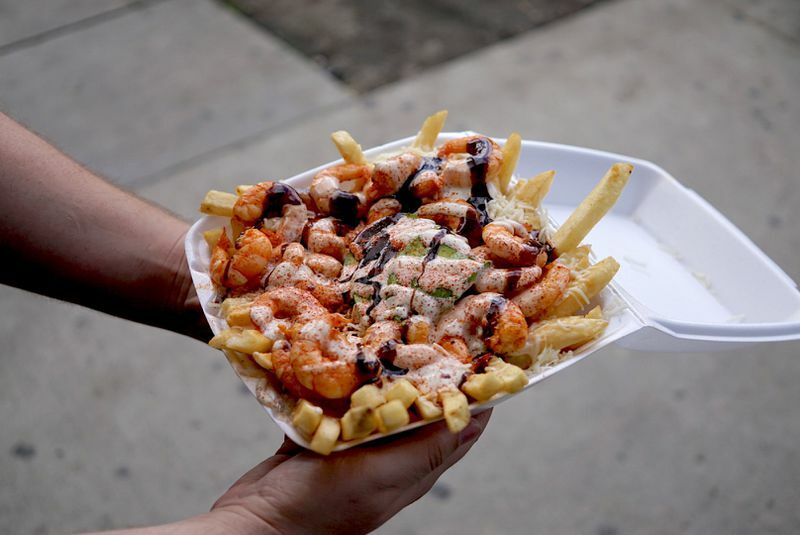 Owner Edgar Sanchez goes into cooked seafood too, including a Boiling Shrimp-style boiled shrimp bag as well as the epic loaded-fries platter of shrimp, magi, cheese, avocado, and mayonnaise that looks like a glorious mess of a hangover cure. If there’s time and budget though, opt for the seafood tower, snap a picture, and dig in. Mariscos El Bigoton. 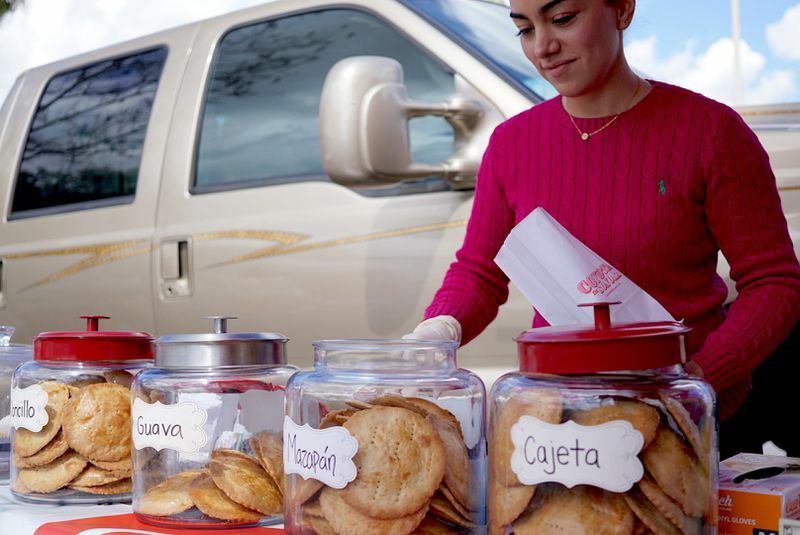 Serving daily from 9 a.m. to 6 p.m.
At this wonderful Sonoran cookie stand along Whittier Boulevard’s street food scene, owners Marisela and Juan Parada set up a tad later than everyone else on the block, around 11 a.m. But it’s worth the wait for their incredible pastries cooked in the Parada home. 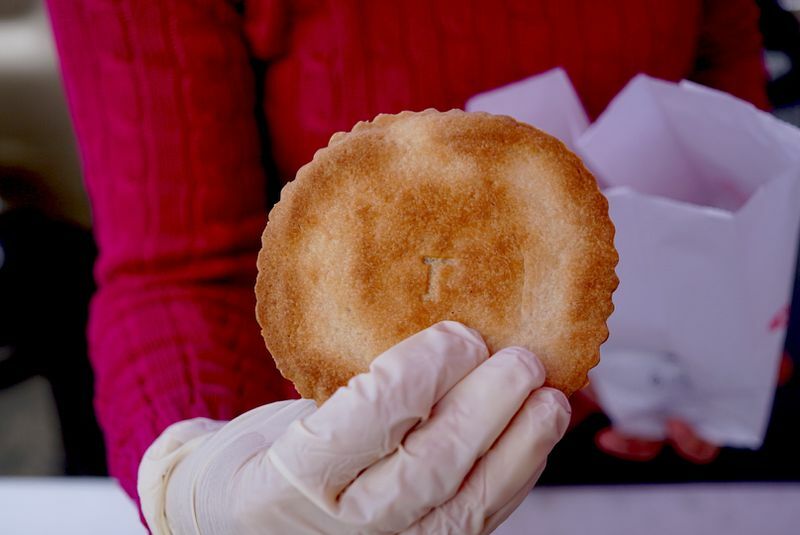 Marisela Parada, a trained biochemist who bakes these crispy, Pop Tart-like sweets with utter creativity, serves three for $6, a modest price for such a special treat. Fillings include dulce de leche, marzipan, guava, and piloncillo, a brown sugar. They’re even better warmed right out of the toaster, and with a cup of coffee to wash them down. 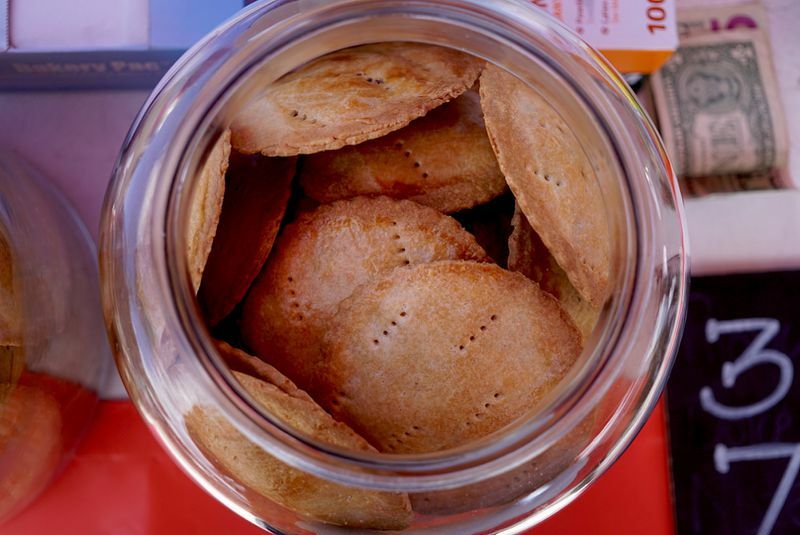 Ask nicely, and Marisela Parada might sell you some homemade Sonoran-style flour tortillas to take home. 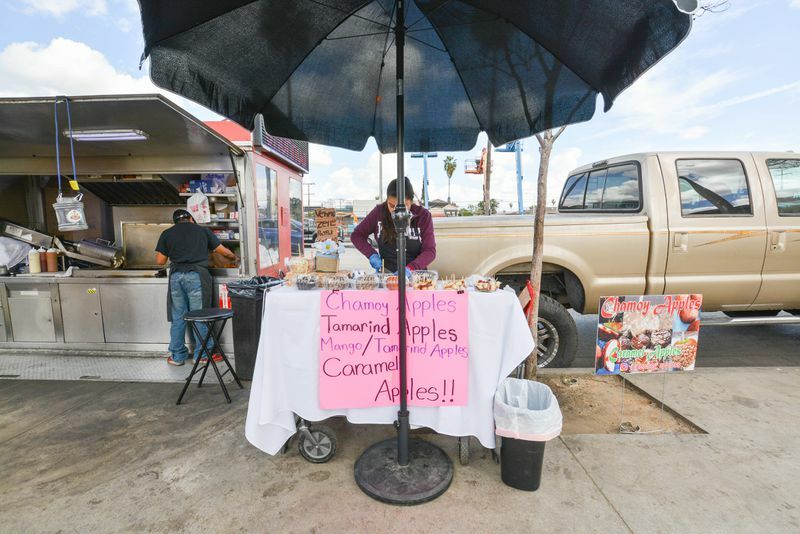 Coyotas de Sonora, available on weekends beginning around 11 a.m.
Caramel apples are just the beginning at Downey Apples, a plucky little umbrella-covered stand along Whittier Boulevard from Marbella Vargas, who’s built up a strong Instagram following but likes to offer free samples of her delectable Mexican influenced confections on the street. She began selling the apples in October 2018, going through car dealerships, offices, schools, and restaurants to find buyers. 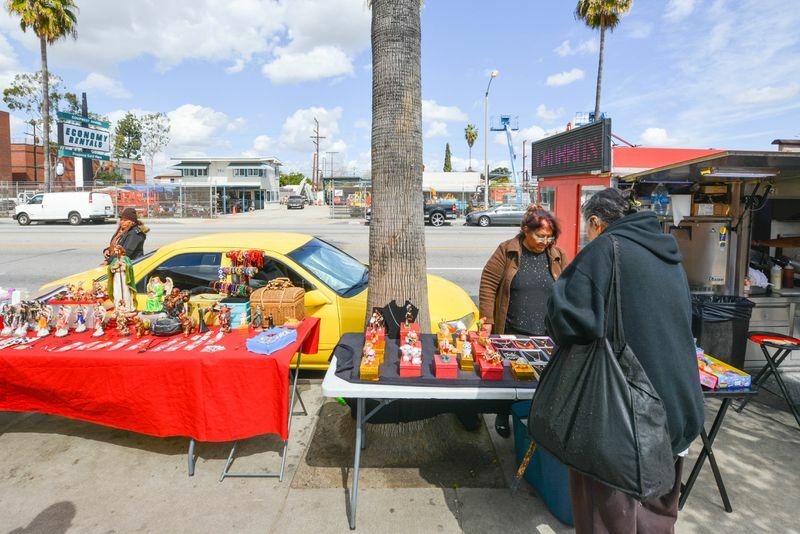 Because of the difficulty of selling this way, Vargas set up a stand on Whittier Boulevard, and it’s been a success ever since. 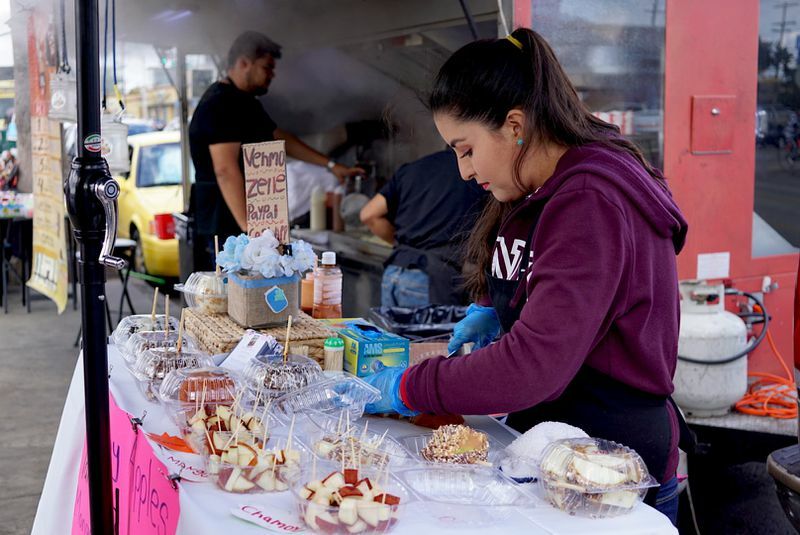 Vargas operates the stand solo, chopping up fresh candied apples offered in a variety of Mexican candy seasonings like tamarind, mango and tamarind, and chamoy, a sweet-sour chile powder. 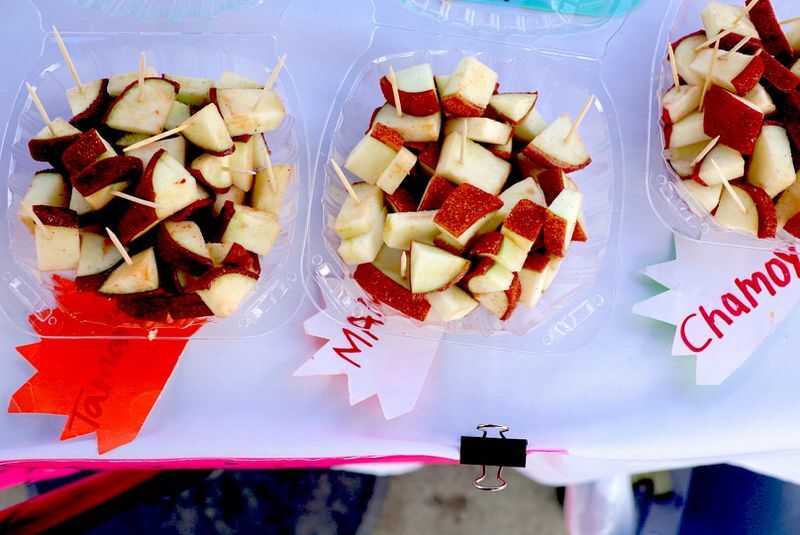 The best-seller is the chamoy, which does a nice job of balancing the seemingly disparate but gloriously tart flavors of lime and Granny Smith apple with the spice of chile powder. The caramel apple is pretty fantastic too, covered with white and milk chocolate along with dense caramel, and everything is available whole or freshly chopped for easier eating. Apples are $5 apiece or $20 for four, but know that the tangy red Mexican versions tend to bleed spice and seasoning once chopped, in case you want to take them to a party. Customers can also text Vargas, whose number is listed on Instagram, to preorder. Downey Apples. 5468 Whittier Boulevard. 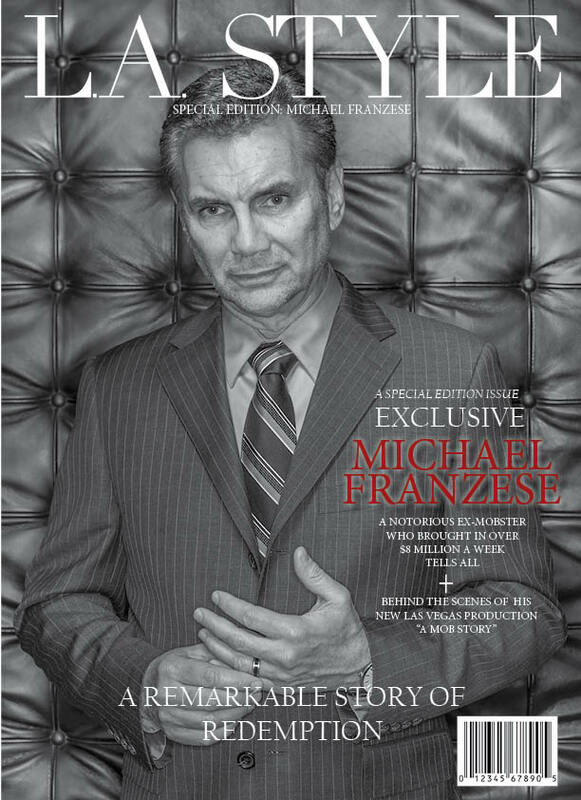 Available beginning at from 3 p.m. to 8:30 p.m. (or so) on Fridays, 11 a.m. on weekends. and until 8 or 9 p.m., or until Vargas sells out. 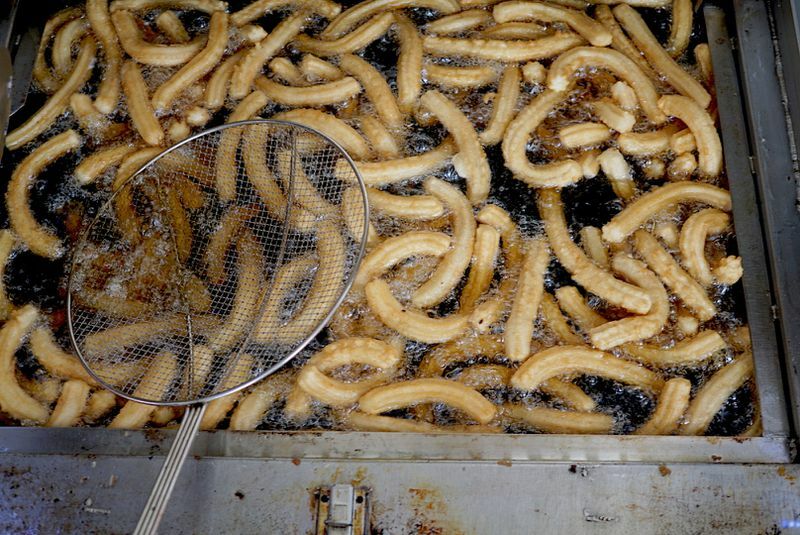 Even though you’ve hit two separate sweets vendors, there’s still the big finish at Churros Don Abel, which rocks an amazing truck rigged with an automatic churro dispenser and massive fryer. 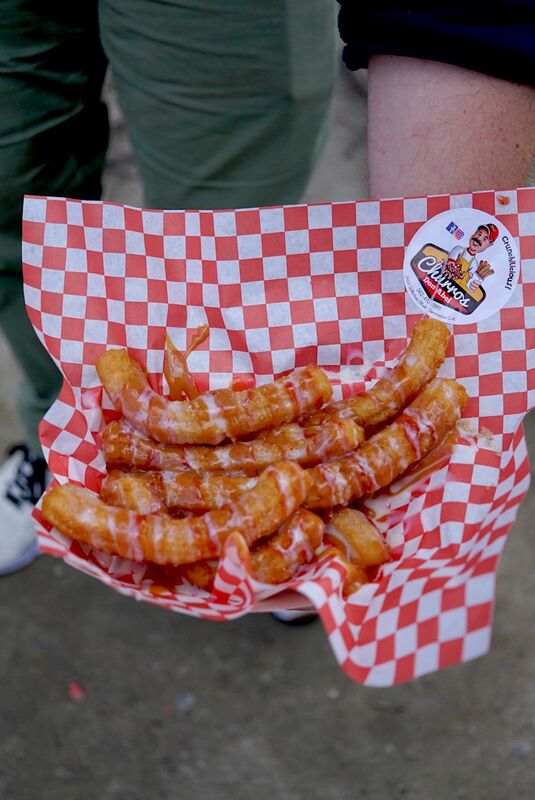 A piping-hot paper bag of 10 cinnamon sugar-dusted churros costs $6, while a more involved paper tray of churros can come laced with strawberry syrup and lechera, sweetened condensed milk, for the ultimate Instagram sugar bait. 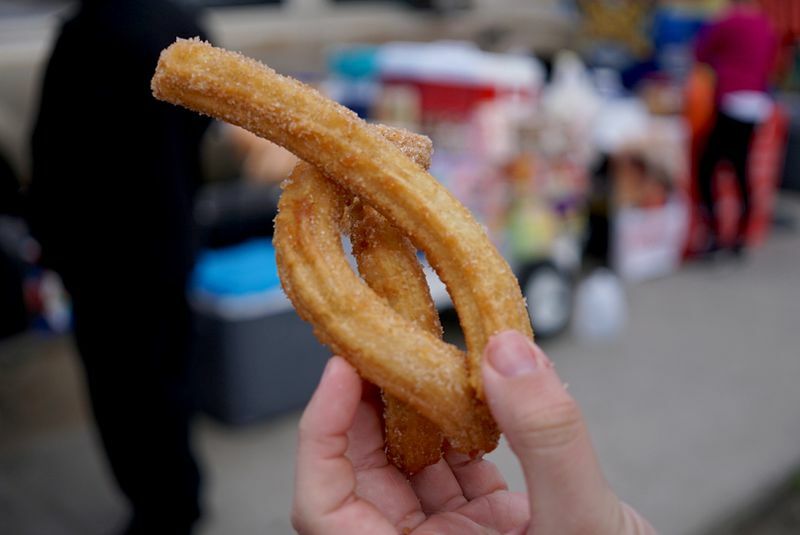 Because the churros are so fresh, they’re incredibly crisp on the outside, but still manage to be moist inside. There might not be a better way to cap an impromptu food crawl down a single block. Churros Don Abel. 5458 Whittier Boulevard. Available weekdays from noon to 10:30 p.m., and beginning at 10 a.m. on weekends.